Ellen is a writer, science communicator and avid bird nerd. Her work has appeared in New Zealand Geographic and Australian Geographic, among others. When not putting pen to paper, she spends her time hanging out with conservation dogs for her Master’s in Science Communication. 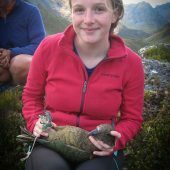 Can Kea Keep Up with Climate Change?